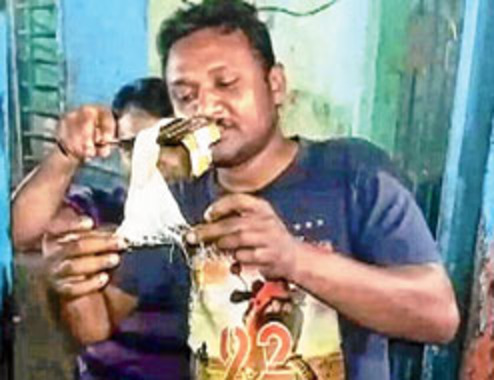 A fast food stall owner in Islampur found eight suspected "plastic" eggs while his staff was preparing egg rolls for customers yesterday evening. Rosomoy Sarkar, the stall owner, stopped serving his customers and informed police. Sarkar, who runs his stall in the Station Colony area of Islampur, today said: "Yesterday, I had bought 30 eggs from a wholesaler. While I was on my way to the stall on cycle, the eggs had got hit with the handle a couple of times. I was worried that some eggs might have broken but found that not a single egg had been damaged. This left me suspicious." "Few customers ordered egg roll and I asked my staff to prepare the rolls. As they broke the eggs and fried it, both the yolk and the egg white began spreading like a plastic sheet. The sight was quite unusual. We broke eight eggs and every time, it was the same scene. I told my customers about the problem and did not serve them and informed the police," he added. Islampur is 110km from here. The police made inquiries with Bikash Seal, the egg wholesaler. "I had bought the eggs with proper papers from an old supplier. I have no clue as to how the eggs can be artificial," he said. Sources said Seal had been asked not to sell the eggs he has in stock unless officials from the administration inspected them. Ayesha Rani A, the district magistrate of North Dinajpur, said: "We have ordered a probe. We are on alert and will take steps to prevent the sale of artificial eggs in the district." In Jalpaiguri town, at least two residents said they had been served artificial eggs. The residents, who hail from Adarpara and Dangapara areas of the town, said an obnoxious stink emanated from the eggs as they broke them. One of them also said that as he tried to burn an egg, it smelt like plastic. A fast food stall owner in Islampur found eight suspected "plastic" eggs while his staff was preparing egg rolls for customers yesterday evening. Rosomoy Sarkar, the stall owner, stopped serving his customers and informed police.